Rather than asking people to smoke ecigs or traditional cigarettes, the scientists and researchers involved in the study simply exposed human lung cells to vapors from ecigs and smoke from cigarettes over time. The researchers also used a red dye to identify live, dead, and dying lung cells. Each of the three groups of lung cells – those exposed to ecig vapor, those exposed to cigarette smoke, and those exposed to clean air (control) – were exposed for 60 minutes. This is an estimation of the average amount of time that people spend vaping or smoking during a 24-hour day. The result? They found that ecig vapor is anywhere from 70% to 97% less toxic than traditional cigarette smoke. Despite the fact that the study was meticulously conducted by a leading manufacturer of cigarettes and vaping products, this study won’t be posted all over Facebook or retweeted thousands of times. In fact, according to the FDA, vaping and smoking are one and the same. They often ridicule studies such as these, claiming that the results are biased simply because the researchers themselves are strongly connected to the tobacco industry. However, for those who are strong advocates of vaping and e-cigs, that just makes the news much more astonishing. All in all, these findings prove what the manufacturers of ecigs and eliquids have been saying all along. 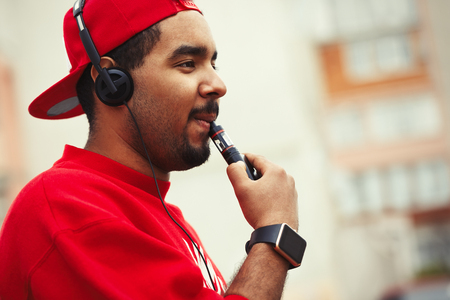 Vaping is a safer alternative to smoking simply because the vapor produced by electronic cigarettes does not contain the same cocktail of potentially dangerous chemicals. It seems like common sense to most people who use these products, and thanks to this study from one of the largest producers of tobacco products in the world, it’s been proven. Electronic cigarettes continue to grow in popularity among smokers who want to cut down or quit their use of traditional tobacco products. They provide an opportunity for smokers to continue to get their nicotine and the pleasurable experience they enjoy, but without the harsh chemicals that cause lung cancer, emphysema, heart problems, and more. *Vintage Joye Vapor Lounge has researched this information and is simply sharing the information with others, Vintage Joye™ is not making any claims to the public that Vaping is better than Cigarettes, they are simply showing the research they have found from various studies that have been concluded. Vintage Joye has not done any studies on electronic cigarettes, they are a Retailer.